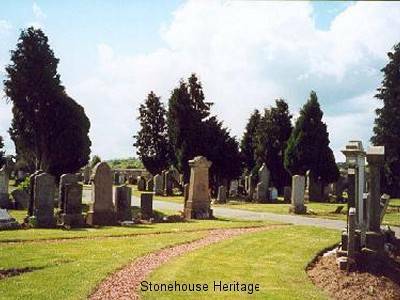 The Manse road cemetery is , only a few yards from St Ninians Graveyard and the Glebe , and is commonly known as the “middle cemetery”. It was opened around 1907 and contains 554 plots or ‘lairs’ as they are known in Scotland. 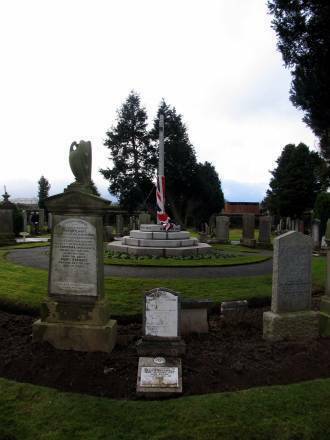 The cemetery is laid out in three different sections (A,B and C) and is arranged around a central circular feature containing the Cenotaph dedicated to the men of Stonehouse who died in the two World Wars. (A searchable index of personnel who were killed in WW1 is listed under Village at war , however further details are available to paid members under the historical information drop down menu. 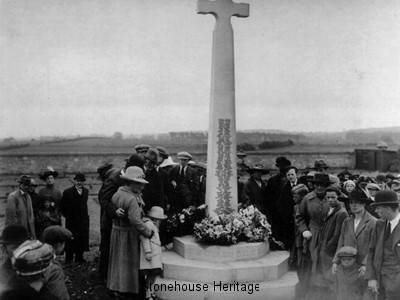 Research on the war memorial which was started by the late Jim Davidson of Aldersyde cottage on Side head road and subsequently picked up by William Mackie the group identified twenty eight personnel from Stonehouse who were missing from the Cenotaph. Lottery funding was obtained and in 2007-2008 the group organized the cleaning of the war memorial, pointing of the steps and the adding of all identified personnel missing from Cenotaph. 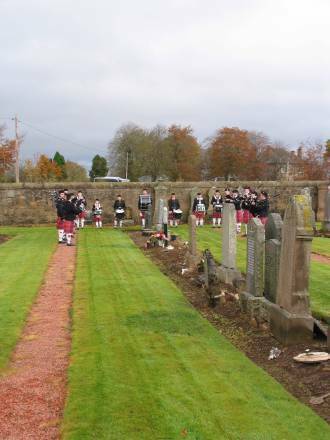 A rededication service was held on 6th November 2008 attended by MSP’s, MP’s local councilors and military personnel. The following thumbnails provide some pictures of the 1921 and 2008 ceremony . The group through its voluntary members commenced recording the gravestone inscriptions for the cemetery. Thanks go to Harry Carty who commenced this work and to Robert Freel who transferred the information into a format that could be viewed and searched on the website. An index of interments was compiled by the late John Rogers a member of the group for a number of years and whilst it is not 100 percent up to date it will give those researching family history a starting point for searching the cemetery. Millar Mrs Gavin 60 477 456 & 482 ?